Toyota and Lexus were so many things, but exciting in appearance is not one of those. Akio Toyoda, CEO of the largest car company in the world, decided that enough is enough and that no boring car will leave its factories again. It wasn’t empty talk, just take a look at the Lexus new line-up. There is no better place to let your imagination wild than in sports car territory, as here styling craziness is often properly awarded, take Lambo or Pagani for example. 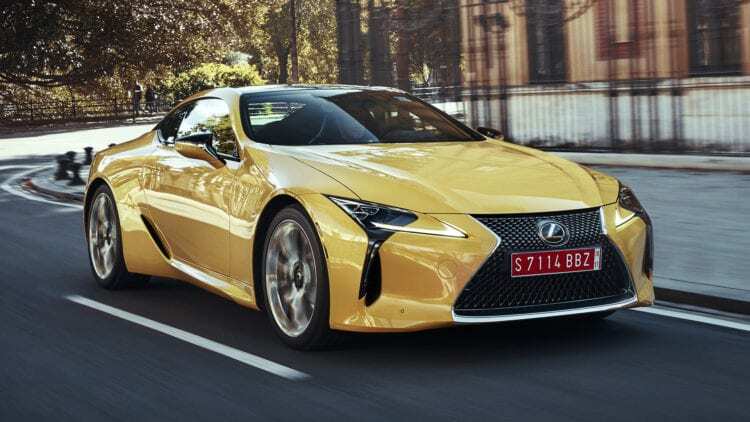 Ok, don’t be confused now, we are not welcoming new LFA, yet something more usual as the new 2017 Lexus LC500 hits the market and doing it in the segment where Lexus hasn’t been before. It looks berserk. All styling madness seen from Lexus so far is nothing compared to this. It is probably most polarizing car in the world, as it is impossible to stay neutral while looking at it. Love it or hate it, it made a big noise, and there is no such thing as bad publicity, people say. Previously insane looking RC now appears like family hatch compared to this. No matter how something is crazy looking by time dust will settle, but be sure that if you go for it, it will baffle you for long, long time. The final decision whether it is amazing or repulsive is for each of us to figure out, and we are leaving it open here. The cabin is more restrained, but still a long way from usual. As outside, it is still commotion of things, making it confusing or glorious depending on the viewer. Some things are certain, and there is no doubt in the perfect quality of materials, abundance of leather and an overwhelming sense of luxury. Flowing design of door panels with handles just suddenly emerging from is breathtaking and timeless, while in the same time air vents on the dash appears like a plain joke, as they could easily fit Corolla’s interior of 90’s. Again final decision is on you, and whatever side you choose we know that you are going to defend it vigorously. Proper things are happening here. Turbo era, inspired by efficiency and emission regulations, is pushing naturally aspired engines into extinction. Lexus just nodded its head, recognizing the trends, but nevertheless went proper way with old school massive V8 5.0-liter bringing birth to 471 horsepower and 398 pound-feet of torque. 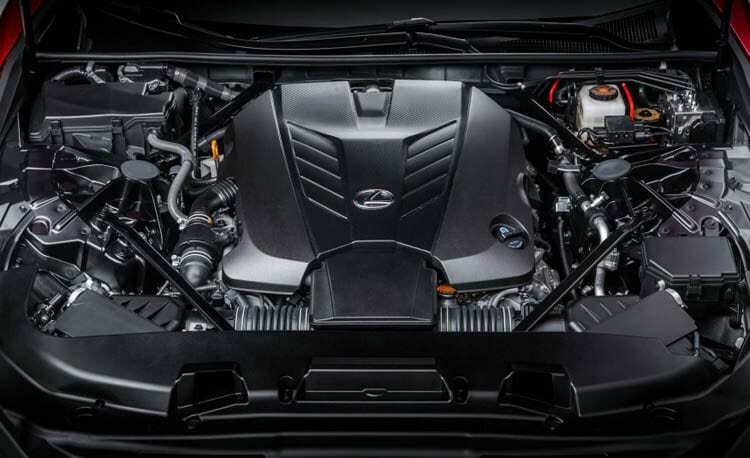 The role of the gearbox is played by expected 10-speed automatic and power goes to the back wheels. 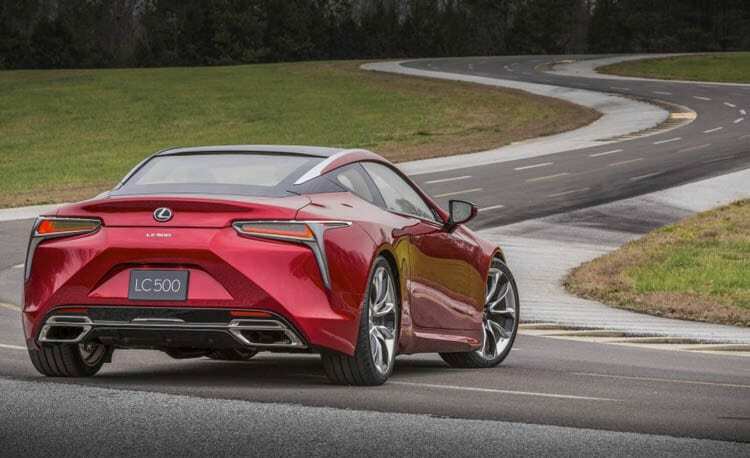 If you feel guilty for the planet, go for hybrid LC500h as there is no middle ground here. Feeling of guilt will bring loss of 115 horsepower and if we say that 0-60 time of proper engine is 4.4 seconds, did we vanish that feeling? 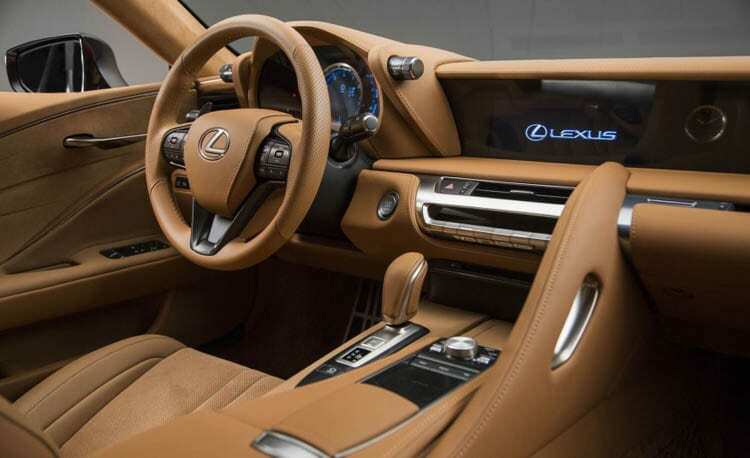 It is Lexus, and it didn’t fail its roots, so it will be a gentle cruiser, emphasizing GT side if you want it to. The main thing is it can turn into a beast, but not ravaging one, and only on your demand so that you can have proper fun on the back roads, just leave the race track to a different kind. Despite classic smoothness of the brand in question, it can be tail happy, responsive and quite informative at the wheel. LFA was planted on the road, it had its roots on the pavement, and you really had to break boundaries to make it lose its ground, and some of that type is transferred here. Thank you, Lexus. 2017 Lexus LC500 has myriads of rivals, Porche 911, Merc S Coupe or AMG GT, BMW 6, Jag F-type R, Aston Martin Vantage and more. If we look at this $100k thing as luxury lavished grand tourer half of the competitors falls out of the equation, and if we look at it as a frantically designed piece of art, we don’t know who is still left. If you are bought by its eccentricity, there is no proper substitution yet on the market and question is whether it will be.